MANILA – More than a week after the West Contact Services Corporation, with around 5,000 workforce, changed its name into the Alorica Contact Services Corporation, hundreds of its employees in Makati are working to register with the labor department the union they have successfully formed as they grapple with the uncertainties of the change in company ownership. 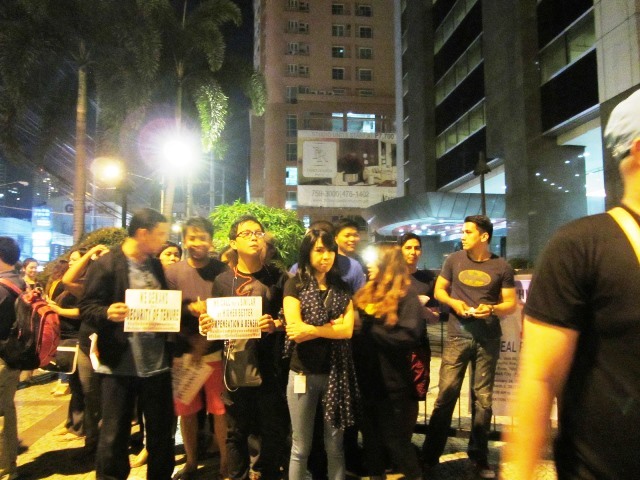 With the help of BPO Industry Employees Network (Bien), they have launched a picket protest last February in front of the Export Plaza building, where their offices are located. They have been demanding a black and white assurance that their wages and benefits, tenure and working conditions under West, would remain, or improve, under Alorica. The restiveness stemmed from what employees described as Alorica’s notoriety for giving lower wages (compared to West), and eating up smaller BPO companies. Some West employees themselves reportedly still bear the trauma of having been summarily laid off or forced to accept worse job conditions when Alorica bought into their former BPO employers. “That is why we are forming a union,” Francis Ugay, 33, technical support representative and newly elected union president, told Bulatlat.com on April 17, the first day West became Alorica. The new unionists conducted a forum in three shifts that day, to discuss their rights as employees and unionist, their duties and responsibilities, and actions to take to defend what they already have in terms of wages and benefits. They hope to improve on that, if possible, as they distribute copies of a draft collective bargaining agreement to employees, some of whom have yet to add their names to the union membership. The forum hosted by the new union of Alorica employees was attended as well by lawyer Remigio Saladero of Pro-Labor Assistance Center, former Kabataan Partylist Rep. Raymond Palatino and Bien president Ian Porquia. Ugay said they are currently handling many termination/dismissal cases. “We’re doing paralegal work for employees that are on case con’s,” he said, speaking of the assistance the union is giving to employees, member or not, who have received lots of negative marks for attendance or performance or both. Case con’s are case conferences where the employees’ fate is determined – if he or she will be terminated or given additional trainings or opportunity to improve performance. During their labor rights forum last April 17, a recurring situation turned up from cases brought by employees. They said their merit card was being deducted points twice for one point-deductible case. For example, when they were absent, they were deducted points. But, on top of that, they were deducted points also for not recording a sale or meeting the quota that time. The employees asked: isn’t being deducted for absence enough? “You get progressive PIN (or warning) for, say, attendance violations. Then, on top of that, your scorecard also get deducted points incurred due to attendance violations – for example, unmet scorecard metrics, which merit another PIN (or warning). This creates a situation where employees are unable to get a secured permanence despite his/her regular status,” Ugay explained. When asked about their work condition and setup a week into being under Alorica, Ugay told Bulatlat.com, “I believe it went for the worse and the management is relentlessly on the attack mode targeting union members. ER (Employee Relations) Office has never been this busy with administrative hearings,” he said. But, she added, the management has been asking employees to sign a “code of office discipline update” since this April, seemingly targeting employees who have not yet formally joined the union. Prestoza said the management is asking employees to agree to changes in regulations, but the changes to be made are not stated. She added that, on the other hand, some employees are increasingly becoming aware that they shouldn’t just sign anything like memos concerning penalties without first taking the allowed three days to review it. Asked if the company is preventing them from forming a union, Ugay cited a production officer in charge who told them she recognizes the employees’ right to form a union. He noted, though, that the same officer cautioned them against doing union organizing at work. The employees are thus conducting meetings after work or online, reporting sometimes of incidences when other employees would tell them: Why didn’t you tell us about this (union)? And then they would join the union, Ugay and Prestoza said. Ian Porquia, Bien president, congratulated and commended the Alorica BPO employees, for their hard work and campaign to have a voice in their work condition and tenure in the company, and for successfully forming a union. He said it is a first in the BPO industry in the Philippines. eh mga bobo naman officers ng union na ito eh..gumawa sila nya. Kasi matatanggal na sila.. This can potentially cause the death of the industry.